I assume this is due to the metrics of the Pagella Math font, because this does not seem to occur (or at least not as noticeably) with Computer Modern. As seen above, a workaround is wrapping the square root in a \smash. Is there a better way around this? I'm not sure I'm happy with how the \smash workaround looks. Also, with this I have to remember to wrap every potentially problematic \sqrt in \smash. The effect is also visible with standard LaTeX and mathpazo. 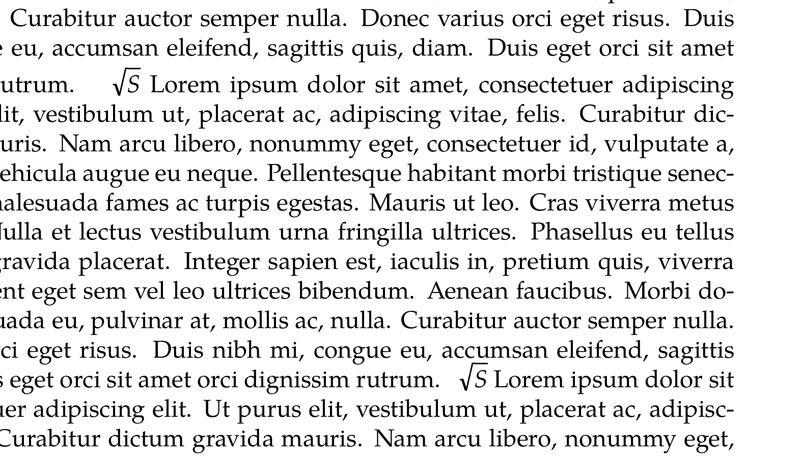 You can “fix” this by enlarging the leading, which is something I learn always to do when the text font is Palatino. If I use the standard square root sign from Pagella, the line would again turn out to be too high. Not the answer you're looking for? Browse other questions tagged xetex luatex line-spacing unicode-math tex-gyre-math or ask your own question.